Treat dry winter skin to a taste of summer with the heavenly scented natural moisturisers from Betty Hula Containing only pure ingredients to intensively hydrate and pamper skin, choose from sensuous Champagne & Spice or rich Rum & Blackcurrant fragrances, available from Sainsbury's (£12.99, 120ml www.sainsburys.co.uk). 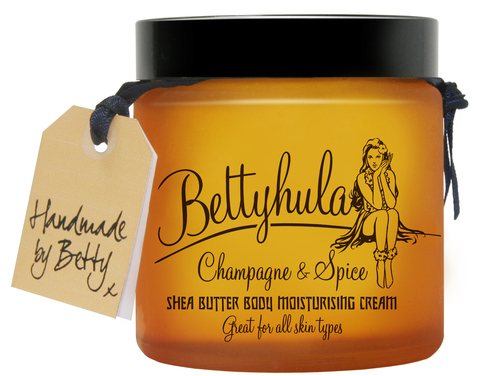 Handfinished and presented in glamorous retro jars, Betty Hula moisturisers make the perfect Christmas gift. Containing highest quality, fairly traded shea butter, aloe vera, coconut oil, cocoa butter and vitamin E, Betty Hula moisturisers gently nourish all skin types. Betty Hula’s ‘The Secret’ wonder oil is excellent for soothing irritable winter complexions and helping to reduce the appearance of fine lines and blemishes (50ml £12.99 from Sainsbury’s www.sainsburys.co.uk). Blending Grapeseed Oil, Apricot Kernel, Avocado Oil, Hemp Oil, Vitamin E, Rose Absolute and Jojoba Oil, The Secret is 100% pure and presented in a beautiful handfinished bottle. Betty Hula products are suitable for all skin types, are free from chemicals and only contain ingredients from natural, renewable sources. The Betty Hula brand combines back-to-nature ingredients with the pin-up vintage glamour of the 1950’s. Carefully handmade, each recipe contains wholesome, natural ingredients, chosen to counteract the stresses and strains that busy modern living puts on the skin. Samples and high res images are available.